NEW ORLEANS (AP) — Anthony Davis gave the Pelicans‘ latest lineup tweak a ringing endorsement. John Wall added 17 points, while Bradley Beal had 16 points and 11 assists for Washington, which struggled to match the Pelicans’ pace or presence under the basket. 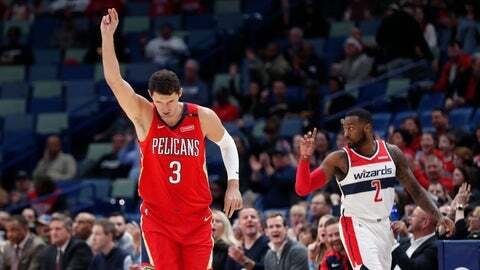 Wizards: Lost to New Orleans for the first time in seven meetings and only the second time in 15. … Wall was assessed a technical foul late in the third quarter for bickering with officials after he was called for a hack on Holiday’s transition layup attempt. … Jeff Green had 10 points. Pelicans: Mirotic is 14 of 28 from 3-point range in his last four games after going 3 of 8 against Washington. … New Orleans improved to 9-2 at home, but plays its next two on the road, where the Pelicans are 2-9. … The Pelicans committed 20 turnovers, down only two from Monday’s loss to Boston, but their scoring was up and they largely controlled the game while also forcing 16 Wizards turnovers. Frazier’s insertion began paying dividends early. Holiday, who committed eight turnovers Monday against Boston, had 16 points and one turnover in the first half versus Washington. “We did a good job of getting back to who we were,” Gentry said, alluding to his team’s 4-0 start, during which it averaged 128.3 points. Even with Davis starting 3 of 10 for nine points in the first half, New Orleans opened up a 20-point lead. The Pelicans closed the first half on a 21-7 run, beginning with Frazier’s transition layup and 3-pointer. Randle closed out the run with a layup as he was fouled and a tip-in of Darius Miller’s missed 3, making it 67-47 at halftime. “Everybody stepped up and came in and contributed and it just made my job easy,” Frazier said.